In the last installment of this series, we looked at the bikes we rode when Bicycle Quarterly got started almost a decade ago. How did our preferences change from our familiar bikes with mid-trail geometries, 700C x 28 mm tires and saddlebags to low-trail 650B bikes with much wider tires and handlebar bags? Paris-Brest-Paris 1999 was a bit of an eye-opener for me. At the finish, I bought Bernard Déon’s wonderful book Paris-Brest et Retour, which chronicles the history of this fascinating event. And there I learned about the amazing performances of randonneurs in the 1940s and 1950s, on classic cyclotouring bikes. I also visited Cycles Alex Singer, and saw bikes that were far more sophisticated than my own. As I did more randonneuring, I realized that having my luggage accessible in a handlebar bag would be better than having to stop every time I needed something out of my saddlebag. However, I had heard that handlebar bags negatively affected the handling of the bike. How did the randonneurs in Déon’s book ride 765 miles with their full handlebar bags? I noticed that the French bikes all used a bag-support rack that securely mounted the bag as low as possible, rather than suspending a floppy bag from the handlebars high above the front wheel. On a return visit to Paris, I asked Ernest Csuka at Cycles Alex Singer about this, and he confirmed that a stiff rack was key to good handling with a handlebar bag. When my frame needed some repairs, I used the opportunity to incorporate what I had learned. I had a custom rack made, as well as a decaleur. I made the correct braze-ons, and the builder added them to the fork. When I rebuilt the bike, I replaced the plastic fenders with aluminum ones, mostly because I preferred the way they looked. My bike now began to look like a French randonneur bike (see above, click on photos for higher resolution). The handlebar bag was great, and with the rack supporting it, the handling was fine. The biggest surprise were the aluminum fenders. Not only did they offer more coverage, but they also kept the water inside, rather than have it drip from the edges. My feet (and my bike’s chain) stayed much drier and cleaner. And they were lighter, too! I began to realize that the French constructeur bikes were not just about aesthetics, but also about function. 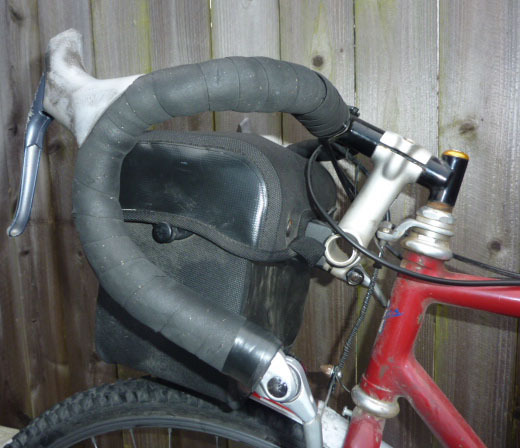 My friend Mark also saw the advantages of a handlebar bag, and came up with his own solution: He attached a second (threadless) stem to his original one. Where the steerer tube usually goes, he inserted a short length of PVC pipe. Now he had a secure, low mount for his Ortlieb handlebar bag. And soon thereafter, he also installed a set of Honjo aluminum fenders. For the time being, we were very happy with our bikes. When I was first considering getting a handlebar bag, countless people warned me against it, saying that most bikes don’t handle well with them. But I think this idea comes from a period in the 70s-80s when handlebar bags were mounted directly onto the handlebars and the bikes were much too aggressive for the kind of riding the cyclist was doing. That is my impression at least. Well, I got the bag anyway, and installed it on my 650B Rivendell with mid trail geometry (42mm tires, aluminum fenders). I got an Ostrich handlebar bag from VO, a VO decalleur to go with it, and a Nitto M-18 front rack. 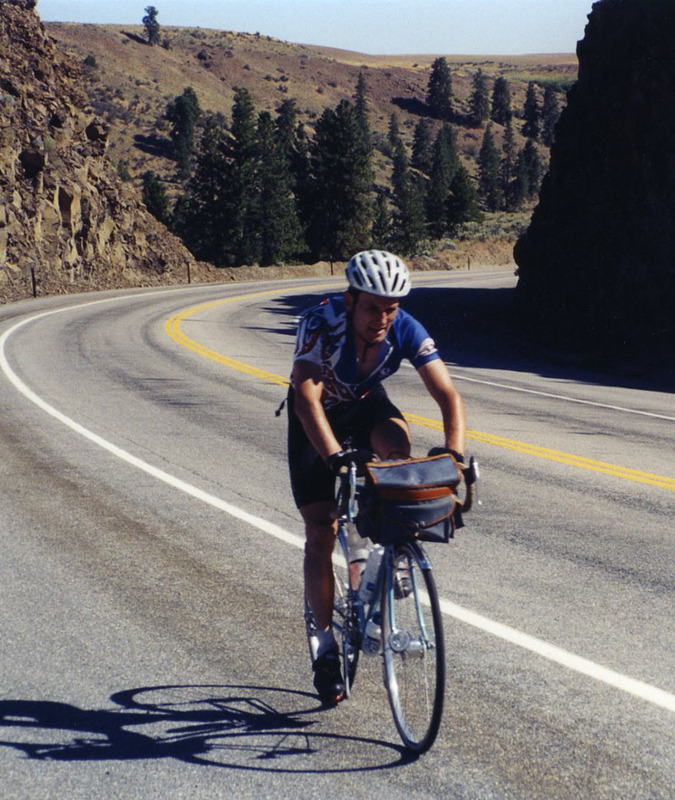 I then took the bike on a month-long trip where I rode it for 30-70 hilly miles daily, typically with 15-20lb in the handlebar bag. I sensed no difference in how the bike handled with the bag, in comparison to how it handled before I installed it, including up hills and on descents. Of course, I am not an experienced/skilled/aggressive cyclist, and so I wonder whether others would sense a difference. I have never tried a bike with low trail geometry, and I am very curious. Unfortunately, it’s not the sort of bike one can easily test ride! With 42 mm tires, your Rivendell probably has what I’d consider “high trail,” which works better with a handlebar bag than “mid-trail.” The wide tires help stabilize the steering further. Good thing you didn’t listen to the people who tried to dissuade you from using a handlebar bag… When I spec’d my first cyclotouring bike with brazed-on Mafac centerpulls, I also had many people shake their heads in disbelief. Back then, people remembered centerpull brakes only from inexpensive ten-speeds. What would you say are considered the cut-off points for low vs mid vs high trail? I *think* my Riv’s trail is around 56mm or so, and I have another bike that’s 54mm. Are those not considered “neutral” trail? Would you please give us some numbers for mid-trail or low-trail? I also just started to use handlebar bag. Because of my small frame size (short headtube length) and racing bike design, I can only use Carradice Super C for a bag with reasonable capacity. The mount is in the mid section, which is good for not rubbing the tire but is bad for handling. I guess the only solution for me is to get a custom bike, but it’s not feasible for the moment. For 650B x 42 mm tires, I'd move each boundary 10 mm lower. But like all boundaries, this is a bit arbitrary. For an unloaded bike, I prefer a trail figure at the top end of the “low trail” range. With a handlebar bag, 10 mm less trail seems to work well. This also depends a bit on your stem height – if you bars are as high as your seat or higher, you should increase the trail a bit (a more rearward weight distribution means less wheel flop). I’m enjoying this series a great deal. My preferences evolved as my understanding of the demands of randonneuring changed, and as I became more experienced and rode a big pile of bikes looking for what met those demands well for me. I started off riding long distance on my late-1970’s racing bike. Tubular tires, saddlebag, no fenders. It was a dream to ride, particularly on the long climbs here on the Front Range, but difficult to carry much on the bike. I wasn’t really a camper anyway. Then I stepped away to run competitively, go to school, and do other things. 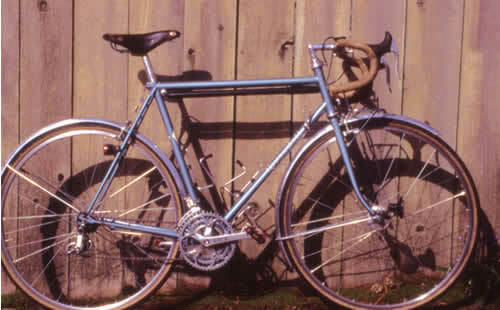 After nearly a decade away from cycling, I came back and began riding brevets on a state-of-the-art Heron touring bike, set up for a rear load and front low-riders, with wide (35-38mm) tires, plastic fenders, and a Carradice saddlebag. For randonneuring, the bike wasn’t ideal. I found I wanted a bike with fewer gears (didn’t need the triple or the big cogs in back), lower weight (My Heron, a lovely and durable machine, weighed about 30lb including generator lights and racks), and a handlebar bag . The latter item is one of the keys to a successful randonneuring machine for me. I get lost easily, forget to eat, and like to keep moving when randonneuring, and a good handlebar bag provides a nosebag, a clothes closet, and a feedbag right in front of you. The Heron was absolutely unpleasant to ride with a 5lb front load. 30lb in panniers was fine, a big load in the saddlebag wasn’t a problem, but it wouldn’t track well and no-hands riding wasn’t in the cards. I switched to what the other local riders rode–a modern racing bike–though I added clip-on fenders after my first rainy brevet and swapped tires for the widest that would fit between the chainstays–25mm. I put an Ortleib handlebar bag on the front, and used the excellent SON generator and B+M halogen lights. I could climb well with the bicycle, it fit better than the touring bike, but all the zipties and clamps were a maintenance hassle, the short fenders were minimally protective, and I’d started reading about integrated bicycles through the (Vintage) Bicycle Quarterly and discussing the machines with Mike Kone, then of Bicycle Classics in Boulder. I ultimately ordered an Alex Singer, which nailed the integrated design–aluminum full-coverage fenders, 28-622 tires, handling optimized for a handlebar bag, integrated lighting–but Ernest missed the fit for me with a steep seat-tube angle, and the bike just wasn’t comfortable for rides longer than 300K. It, in short, wasn’t fit for purpose, which was deeply upsetting, as it is a beautiful and well-thought out machine. I still use it for camping. Finally, after an extended discussion with Mike Kone, who had resurrected René Herse Bicycles in the meantime, and a prototype test-riding effort done as part of the Boulder Bicycle project, I ordered a machine that combined the handling and integrated design of the Singer with the performance of a traditional racing machine. Integrated internal wiring, light tube spec, 30-622 tires, full-coverage fenders, and designed around a 5lb front load. It meets my needs to the extent that I sold my racing bike–it had been superseded. I also ended up buying a Boulder Bicycle Allroad built around the 42-584 Hetres, and it is a comfortable and fast integrated design for mixed-media and off-pavement exploration, commuting, and touring. I am not as fast on it in pacelines and when climbing as I am on the 700C machine, so, for paved-road randonneuring, the Herse gets the nod, but the Boulder Bike sees about a third of my annual mileage. I enjoyed reading your piece! Could you comment a bit more on the steep seat-tube angle of your Alex Singer? Specifically, what is it’s measurement, and why would it be ok for rides up to 300K? I’m curious because there doesn’t seem to be a lot of discussion on seat-tube angles and how they effect the ride of the bicycle. When I read about the machines reviewed and analyzed in Bike Quarterly, typically I see geometries of around 73 degree head-tube and seat-tube angles. Interesting, I would have thought seat tube angle would have been considered fairly important as it has a lot of knock-on effects like front centre dimensions, weight distribution etc. For me, through trial and error, I have found I like a relatively slack seat tube angle. I prefer leather saddles with shorter rails than regular saddles and that restricts the set-back available. There is also a limit to how much set-back the seatpost can give. If the seat is too far back it is easy to use a zero set-back post, if it is too far forward not much can be done. Jan, when you say seattube angle does not seem to make a difference to your performance do you mean that seat setback does not matter when it varies or that you are generally able to achieve your preferred set back regardless of the seat tube angle by moving the seat forward/aft or using a different seatpost? I would have thought 1.5cm would be fairly significant and you would generally sit on the same portion of the seat (and still shift around) regardless of the seattube angle. Many builders used to design “by eye,” rather than drawing every dimension beforehand. Peter Weigle still does it that way. Some things are set on the jig as predetermined parameters – usually head angle, BB drop, seat and top tube lengths, among others, and then the remaining tubes are arranged until the bike looks good. Front-center, chainstay length, and a host of other dimensions fall where they do to create a balanced design, not to some predetermined value. Obviously, to create a balanced design, those values will be within a relatively narrow range. When I said that seat tube angle doesn’t matter much to me, I meant that setback doesn’t matter much to me – again within reason. Weight distribution is an interesting matter, together with chainstay length. Riding a Weigle and my Singer back to back, both with the same front-end geometry, but chainstays that were 20 mm longer on the Weigle, both Peter Weigle and I couldn’t detect a difference in the handling. None – the Weigle wasn’t more stable due to the longer wheelbase, nor did it corner differently due to the different weight distribution. Our conclusion was that within reasonable limits, weight distribution doesn’t matter much. When you think about it, on a randonneur bike, the weight distribution will change radically when you eat the food in your handlebar bag, moving weight from the front to the rear as the ride progresses. On a racing bike, the difference between “on-the-hoods” and “in-the-drops” is significant as well. The average racing bike has about 60% of its weight on the rear, 40% on the front. A randonneur bike with a full handlebar bag is about 55% to 45%. Even those extreme cases aren’t that hugely different, and don’t affect how the bike rides. When the front gets much too light, then you have problems with the front wheel washing out on gravel turns, but that is an extreme condition. To follow up on the seat angle discussion, the seat angle on my Singer is 74deg. I am unable to get enough setback (even with the Simplex seat post, which has generous offset) to use my preferred leather saddle on that machine and have a position comfortable for all-day efforts. That centimeter or so in setback between a 73 deg seat angle and a 74deg seat angle was the difference for me between having a bicycle I could ride indefinitely, and having one that is limited to twelve hours or so before I start having hand, neck, and shoulder troubles. My current randonneuring bicycle actually has a very similar fit (top tube length, saddle to handlebar reach, saddle height), but with a plastic saddle which sits a couple of centimeters farther back on the seatpost, and a 72.5 deg seat angle. As a result, I sit substantially farther back relative to the bottom bracket, and it is the first machine I’ve ridden that didn’t have the saddle racked all the way back on its cradle. I also moved from (about) a 6cm saddle-handlebar drop on the Singer to a 5cm drop on the Herse. My position has rotated a degree and a half around the bottom bracket, yielding an efficient and comfortable position for long-distance efforts. Within a certain range, I’m comfortable rotating my position around the bottom bracket, putting more or less weight on my arms. The fit Ernest ultimately chose for me lies just outside of that range, and it is hard on my hands, neck, and shoulders as a result. It works very well indeed for shorter efforts, and is actually pretty close to how I fit a racing bicycle. Say my bike has a 74 degree seat tube angle and I would like for it to be slacker. I move the saddle back on the rails a bit, and it effectively becomes 72 degrees. Voila! So: what drawbacks are there, if any, to achieving my desired angle in this manner, rather than having the seat tube be at that angle in the first place? Because a steep seat tube angle is helpful in reducing toe overlap, might it not make sense for some to intentionally get a bike with a steeper seat tube and use a seatpost with setback to compensate? >I move the saddle back on the rails a bit, and it effectively becomes 72 degrees. >Voila! You’re right, if there’s sufficient adjustment room available. I was as far back as physically possible on the Singer given my saddle choice. Even with a high-setback seatpost and saddle as far back as it would go (using a mallet to get another 5mm of setback), I was too far forward for long-distance comfort. The bike performs fine, no TCO, good handling and so on, but I’m not comfortable on it for longer than 12h or so. Hence “too steep seat angle” for me for randonneuring. If I’d had additional adjustment room, I’d have used it and saved myself a great deal of money and time having another integrated bicycle built that fit me better for long-distance riding. My current randonneuring machine has a 1.5deg slacker seat tube angle and I can just get my preferred position with a Brooks racked all the way back on the seatpost–the bike was designed, in part, around that criterion, at the expense of a slight touch of TCO (with my size 47 feet and rearward cleats). I was aware that I’d have that issue when I specified the bike, and Mike Kone of Rene Herse bicycles warned me about that potential. People with average-sized feet don’t have TCO on my bike. Ernest Csuka of Cycles Alex Singer once told me that no adjustment on a bike should be at the end of the range – whether the seatpost extended all the way to the limit, the brake pads all the way down in the slot, the seat rails all the way back – he felt it was a sign of poor design of the frame or the components. Usually, with that approach, you can find a good position within the standard range of adjustment. Will, are your body’s proportions different from most people’s? Could the handlebar height also contribute to increased confort? At anyrate, there are days where I start to feel uncomfortable after two hours on any bike, let alone 12! Concerning my proportions and getting pretty far afield from the original topic, I’ve got relatively long arms and legs for my height, and getting a “neutral” position on the bicycle relative to the bottom bracket requires a fair bit of setback, but I’m not notably oddly proportioned. My racing bikes have all been stock machines, and my current randonneuring bike has a typical fit relative to historical norms: 72.5-73 seat angle, roughly square 57-58cm top tube on a 60cm bike, short (9cm) stem, long-reach handlebars (the excellent GB randonneur). I agree completely with Ernest’s approach to frame design. One designs a bicycle to put a rider in their best position in the middle of the adjustment ranges using the equipment they prefer. My Singer wasn’t designed that way for me. I believe you mentioned that we specified the bike with a suitable seat angle, and that design parameter wasn’t accounted for in resulting bike–perhaps I didn’t communicate clearly why it had been included in the order. It is still a fine bike, one that descends well, one that I treasure and enjoy riding, but not for too much longer than 12h or so in a day.